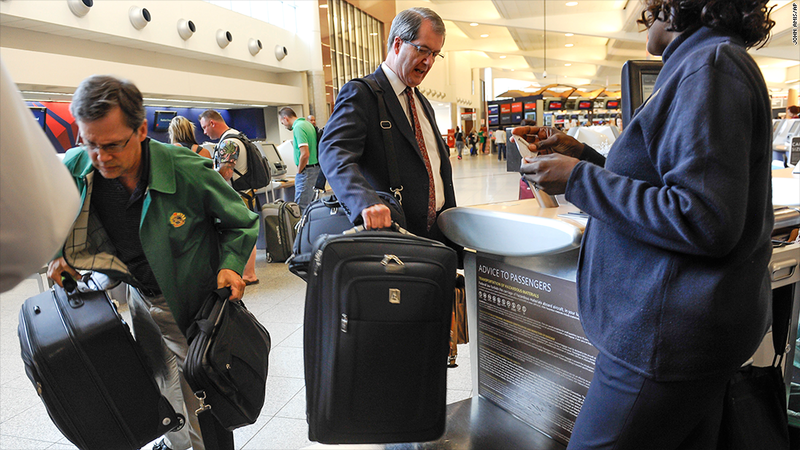 Baggage fees top the list of most hated airlines fees. $50 for a carry-on bag? $200 to change your flight? Airline fees have become the bane of travelers these days. U.S.-based airlines were raking in baggage and reservation change fees at an annualized rate of roughly $6 billion last year, according to the Department of Transportation. And the fees keep getting worse. United Airlines (USBOX) charges an oversized baggage fee of $200 now and increased its fee for a third checked bag to $125 from $100 in December. A United spokesman said the hike better enables the airline to recover costs associated with transporting checked bags, especially overweight ones. Even the cost of taking your Jack Russell Terrier is getting jacked up. Southwest Airlines (LUV) just raised its pet transport fee to $95 from $75. "Adjusting the price will allow us to remain competitive in pricing, yet still lower than our competitors," said a spokeswoman for Southwest. So which of these fees do we hate most? A recent poll of 6,100 fliers by Airfarewatchdog found these fees to be the most egregious. 1. Baggage fees: Spirit Airlines (SAVE) rang in the new year by hiking many of its baggage fees by up to $6 per bag. The standard fees it charges depend on when you pay. The first checked bag is $21 to $30 if paid at booking, $31 to $40 if paid while checking in online, $45 at the airport, and a whopping $100 at the gate. Overall, the carrier has 24 different baggage fees. Many of the other major carriers, including American Airlines (AAL), Virgin America and Alaska Airlines (ALK), charge $25 for the first checked bag. Calculator: When will I be debt-free? There are a few holdouts that don't charge, however. Southwest allows you to check two bags for free and JetBlue (JBLU) allows you one. Frequent flier participants can also escape the fee. Another way to avoid them, is to get credit cards affiliated with the airlines that include free checked bags, advises George Hobica, founder of Airfarewatchdog. 2. Change/cancellation fees: Have a last-minute emergency and need to change your flight? It will cost you anywhere from $30 to $200. "[Passengers] can feel gouged when they get charged. It's not pleasant," said Douglas Kidd, executive director of the National Association of Airline Passengers, an advocate for passengers' rights. Even more infuriating: "With flights so full, the chances are that the airline will collect the $200 fee and turn around and almost immediately sell the seat, perhaps for an even higher fare," said Hobica. He believes the airlines are charging such high fees because they are trying to get passengers to buy more expensive refundable fares. 3. Advance seat selection: The days when an airline let you sit with your family for free are becoming increasingly rare. Allegiant Air (ALGT), the low-cost carrier, now charges up to $80 for this service, AirTran charges $6 to $20, and Spirit $1 to $50. An Allegiant spokeswoman said the airline seeks to offer the lowest fares and one way they do that is by offering a menu of services, allowing passengers to customize their travel to their needs and budget. "For passengers who don't have strong feelings about where they sit, they can travel for a little less," she said. 4. Phone reservation fees: If you have to book your reservation on the phone, most U.S. carriers (Southwest is an exception) charge $10 to $25. Travelers can easily avoid these fees by booking online for free, explained Hobica. 5. Fees for last-minute frequent flier award tickets: A few airlines charge their loyal customers a fee of $75 to book flights with their frequent flier miles within 21 days or less of their departure date. Hobica says the airlines will waive the fee for higher status frequent fliers. So those who have been dinged in the past may be motivated to build up more miles in order to avoid the fee in the future. Kidd sees it much differently. "It's a good way to lose passenger loyalty," he said.